Quite a few more markets than last weekend, including the most excellent UN University Night Market. Lots of good stuff to be had as always at all of them, so make a list for the week and make your way. It's a great chance to practice Japanese, learn new recipes, and get a peek into Japan's evolving food scene. Another hidden gem, but this time over in Mitaka and of some of the best local organic eats around. Wear your elastic-waist pants and make the trek! Today's photo comes right from our Tokyo neighborhood. 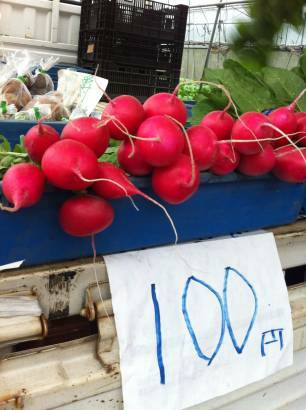 A nearby farm sells their produce directly each afternoon, and these radishes were too pretty to pass up. what great suggestions!!! I only wish I had known of some of these places (if they existed) when I was living in Japan. I'm glad you are keeping others informed- love it!